Contrary to popular belief, digital drawing is not the manipulation of an already existing photograph or painting. There are still many people having trouble believing that you can draw on the computer from scratch and produce original, genuine, hand-made art. There are images on the Internet known as Giclees that are made by scanning an art piece that was created in a different medium. This is not an example of digital drawing, because its original medium is not a digital file. Digital drawing and digital painting have become an increasingly popular trend as the price of tools involved decreases and the uses of digital art increases. 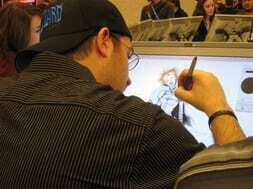 For example, Clayton Crain, uses digital drawing to create his comics. The digital drawing pad, or graphics tablet, used to be such an expensive luxury, that even budding artists were unable to afford one. As the uses of this unique drawing pad extended, it became more and more affordable. Now, it is commonly used by graphic designers, artists, architects, engineers, and even people who view digital painting as their hobby. Although a mouse can still be used to create digital art, a graphics tablet makes the process much easier by reducing strain on your arm and giving you a larger surface area to work with. Besides the popular, efficient, and easy to use graphics tablet becoming affordable, there are three other important reasons why digital drawing has become a popular trend. Simply put, drawing by way of computer instead of paper, expands creative freedom by allowing you to easily do things you cannot do on paper. For example, the graphics tablet allows you to both apply and revise your layers without the risk of tearing, smudging, or ruining your paper. If you want to redraw a certain aspect of your drawing, such as the trees, they can be modified without affecting the rest of your drawing, like the sky or grass. In addition, multiple versions of the graphic drawings can be saved to encourage risk-free experimentation. By drawing on paper, there is no way to duplicate it to reduce risk of making a mistake. Because there is less risk, you will feel a much greater sense of creative freedom to see what works for your unique art piece and what does not. Another way digital drawing and digital painting allow extensive artistic freedom is that an image can have many variations, such as black and white, negative, colored, larger, and smaller, while parts of one image can be duplicated into another image to save time or create surreal effects. By being able to change the size of the image, it is easier for the piece to adapt to the marketplace. The artist can also go back at a later time, when further inspiration hits him, and take the image and alter it to make a new creation with unique surreal effects. Therefore, it is crucial for people to understand that not all digital art is a simple manipulation of an already existing image. Many artists are just as capable of creating wonderful art by paper as by computer. Using the computer, however, offers many advantages over using paper, such as allowing you to easily revise and apply layers without risk of wear and tear, save multiple versions, and apply many different variations and duplicate one part to another to create surreal effects. This gives you extensive creative freedom and control over your artwork by reducing risk of mistakes difficult or impossible to fix.